Our drive takes us along the stretch of the road sandwiched between the tranquil Lake Llanquihue set against the looming Osorno Volcano and miles of green valley dotted by farm animals, walled by spring flowers (yellow lupines), and bordered by the Andean Mountain, which rolls and soars in lush waves. We are heading towards Vicente Pérez Rosales National Park for a walk around the Petrohué Falls. Since leaving Puerto Varas, our guide keeps looking out the window from the motor coach to check if the cloud hanging over the tip of the Osorno Volcano has dissipated. She wanted to show us the 'breathtaking view of the Osorno Volcano' advertised in the tour brochure, I guess. But even screened by clouds, I see in astonishing detail the overwhelming beauty of nature that it excites my awareness. Mirrored in the clear waters of Lake Llanquihue, one of Chile’s largest lakes, are the reflections of the clouds and snow that cover the Osorno Volcano. The volcano never leave our site. Its silhouette floats on the lake. This dramatic landscape provides a very picturesque setting throughout the long 90-minute ride to Petrohué Falls. When we arrive at Vicente Pérez Rosales National Park entrance, the peak of the Osorno volcano is still hidden behind the clouds. 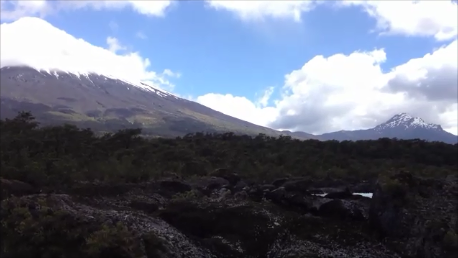 But there is another smaller volcano showing its full splendor, its peak crowned by snow. The site of the volcano and the face of the mountains and the sound of the river rapids and the waterfalls interspersed like a scene from ‘Planet Earth’. The whole place is a microcosm of the planet itself. It made me understand why Pablo Neruda, one of my favorite poets, wrote in his memoirs, "He who does not know the Chilean forests, does not know the planet."